Tell the FDA to investigate into the harmful effects of genetically modified ingredients in our children's food. The term "genetically modified organism" (GMO) may not be one that exists in most people's everyday lexicons — but it is one that needs exposure, because GMOs are found in many products we buy today. GMOs are foods whose chemical structures have been modified, and can introduce new allergens into food as well as contribute to antibiotic resistance. In fact, GMOs can be found in many of the foods and products we give to our children these days. 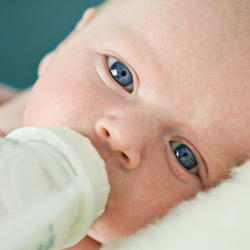 Infant formula, baby bottles, baby foods — these are all products that are made for children, who by definition also happen to have highly susceptible immune systems. Until GMOs are proven safe, they shouldn't be used in ANY of our products, especially those widely used by young children. Tell the FDA to stop allowing the use of these products until it has proven them safe for human consumption. Children consume many products that may be genetically engineered. Because the FDA hasn't required an regulatory testing on GMOs, companies use them in their products without acknowledgement to the harm they actually may cause. The problem with GMOs is that they are products whose chemical structures have been altered, and there has been no evidence proving that these modified substances are safe for human consumption. Because the chemical make-up is genetically engineered, products can cause unforeseen allergies and resistance to certain antibiotics. Children are much more sensitive to toxins than are adults, which is why it's completely counter-intuitive to provide them with products that haven't been approved by the FDA. For the health of our children, please don't continue to ignore this important issue. That's 11,263 signatures! Let's keep the ball rolling.